So this is what happens when you portage. Portage is both a verb and a noun. It is the physical act of carrying the gear, but also the route on which the carrying is done. You take everything you brought, food, clothing, tent, sleeping bags, whatever you thought you couldn't live without for a few days, and put it into the canoe. Then, you paddle across a lake in whatever direction you've chosen, until you find a portage that you have selected on a map. Portages are pretty easy to see because they are a little different than the average shoreline. There is usually a bit of a clearing and a noticeable trail running up from the water's edge. Once you get close, you can see marks from previous canoes on the rocks, so you know you're in the right place. Portages can be long or short. They are measured in rods, a rod being 5.5 yards, which is 16.5 feet, or roughly the length of a canoe. 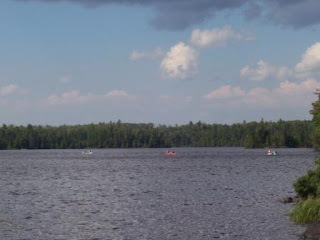 Sounds like not so long, but when you add a canoe that weighs about sixty pounds, or a Duluth pack full of food or cooking gear that weighs around thirty, factor in the rocks and, if it's been raining (which it had), the mud, it can be quite challenging. The four youngest members of our group were surprised by the difficulty of the portages. The seventy-somethings and the fifty-somethings were carrying as much, if not more, of the weight of the gear. We all, however, had done this before and knew what to expect. The twenty-somethings did not. And I have to say, even I was a bit stunned by the portages. The reason being that when hubby and I went a quarter of a century ago, we had a 20 rod portage. And we were half our age. Still, the kids were troupers. Once you're at this point, you have no bars on your cell phone. It looks like a nice little trail, but you're pretty much out on your own here. 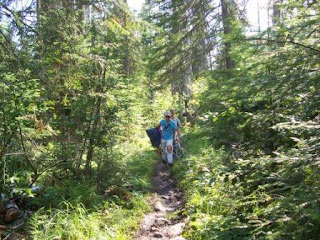 It took almost all of us making two trips down this trail to get our gear down. One of the reasons that we picked this particular week is because the mosquitoes are usually not as bad. We, however, experienced horribly large and aggressive insects while we were there. Deet wasn't very effective on them. I actually sprayed it right onto a mosquito on my jeans and I think it drank it. 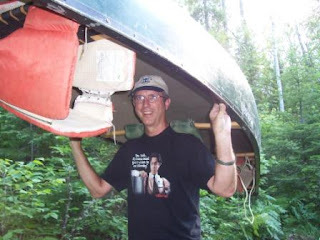 This was our first portage, the second was ten rods longer. By the time we reached our destination, everyone was pretty tired. . .
Wow, You should have rented one of the inflateable carts for portages. bill - Now why didn't I think of that? cod - There will be a picture of our version of the Marriott in the next installment. And if you think that's gorgeous, wait until the sunset pics! A word of caution. Don't rent inflateable carts if porcupines are around the portages! I'm trying to figure out why you think all that hard, exhausting work is FUN!!!!! And then, when you get there---you have to set up camp, and worse yet---cook a meal over an open fire? YIKES!!! I'm glad, tho, that you-all enjoyed it!!! trev - Yeah, but you survived it! bill - The mosquitoes were so big I think they could have taken down an inflateable cart. lois - I don't know that the word I would use is 'fun,' but maybe I can address that in the next post! Great job of capturing the pain of the portage. I was never a canoer(sp?) so I can't sympathize physically, but I can certainly understand that it's not easy! jeff - The younger members of the group were definitely in shock at the end of the first portage. Welcome to reality.